World premiere on my blog. After staying true to the Dread Elves for many moons, it was time to lead another army into battle. The "Army of the Dawn" is my take on the Empire of Sonnstahl. Do not let the looks fool you, the soldiers might look my Bleak Legion , but they are really somebody else! In their very first battle, the Army of the Dawn marches north, to claim some barbarian lands for the God-Emperor. However some heathens praying to strange and terrible gods stand in their way. Will the aim of the armies shooting stay true or will they perish under the great brutal weapons of the Dark God's Warriors? What better fight than one between kin? A fight between kin with our favourite mythological creatures: Dragons, walking trees, the Medusa and a Manticore. It was all there in this battle between the Sylvan Elves and the Dread Elves. Now with an extra pre-game strategy section! Corsairs: Where is the „Arrrr“? 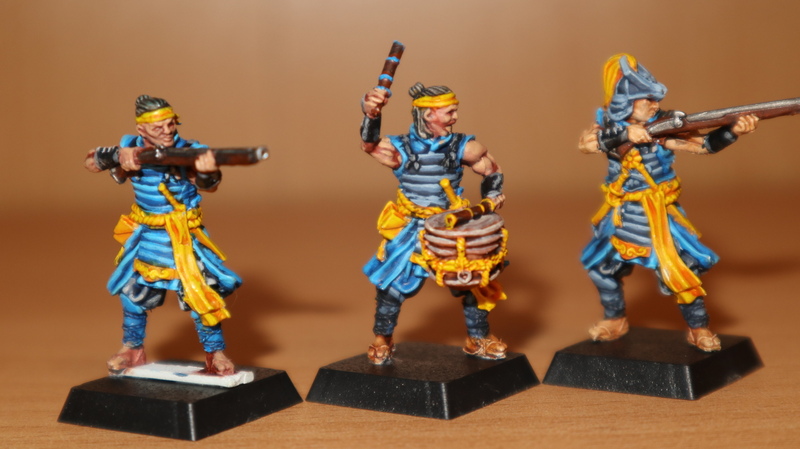 In my newest blog post I summarize and update my ideas and thoughts on the Corsairs and ask the question: "Why aren't they properly pirate-y?" Who would adapt to the new rules of engagement better? The vicious Bleak Legion, led by the Oracle which divides Cosmos and Chaos? Or the reptilians with their cold-blooded hearts? This time the Vermin Swarm showed up again. they could persevere and feast on the corpses of the Nabh followers. See what Shauka, supreme master of the Metal and Corssbow master shot has in store for them. This time the Highborn though they don't even want to touch the their dread cousins. The tips of their arrows should rain death on the dark ones. Of course the Dread Elves saw all their prejudice confirmed and took wagers, which soldier could avoid the arrows of the enemy the best. It's Sword versus Arrow and it is bloody. The Dread Elf expedition force under the rule of an Alchemy Oracle ventures into a deep forest, as the leaves whisper. Something hides beneah the dense canopy. The traps springs and arrows fly. Will the Dread Elves prevail or become fodder for the worms? The Vermin rear their many heads again. Will the Dread Elf Oracle and her troops be able to contain the infestation?